According to the Bureau of Labor Statistics, repetitive motion injuries (RMIs) are on the rise. These injuries represent 60% of reported occupational illnesses in the U.S. The private employment sector is shelling out over $25 billion per year in direct costs from absenteeism and workers compensation claims. Indirect costs are estimated at four times that amount. This increase in reported cases is partly due to the fact that certain soft tissue injuries are becoming more clearly linked to the duties employees perform at work. OSHA has begun recognizing the factors that lead to such injuries at the federal level. California and other states are in the process of developing and instituting more stringent regulations for state OSHA programs to ensure that employers follow good ergonomic practices. There are many different strategies for reducing the incidence of RMI in the workplace. One solution to improve posture and make industrial work less likely to cause injury is through the use of ergonomic work benches in assembly and technical support areas. 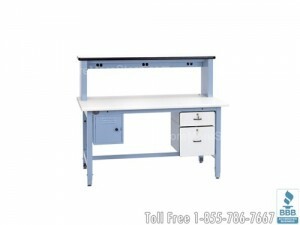 At StoreMoreStore, we carry top of the line adjustable benches and tables including kitting workstations and electronic assembly workstations. 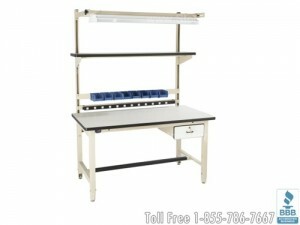 These adjustable work benches allow each employee to set the appropriate and easily change the work surface height for their personal workspace. That way, they can rest their arms and avoid hunching over and prolonged body positions that promote repetitive motions injuries. 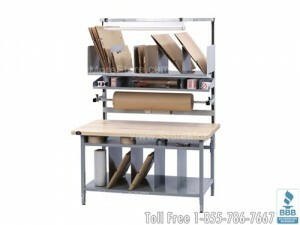 Technical work benches and ergonomic workstations also include a rolled front table edge to reduce pressure on an employee’s forearms. A footrest offers the option for workers to elevate their feet and take weight off their thighs throughout the day. When employees are supported with appropriate ergonomic furniture, they are less prone to repetitive motion injuries. Employers benefit from fewer workers’ comp claims, higher productivity, less worker fatigue, and better quality workmanship. 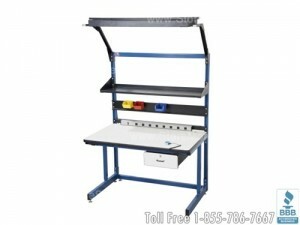 See our adjustable work benches and ergonomic workstations here!